When Google opened registration for I/O, demand from the public made the Tickle-Me-Elmo rush look like a small group of seniors enjoying a day at the mall. After the servers were slammed for a total of 59 minutes, every last ticket had been sold, at least according to Google. At the end of February, tickets for the event (and the supposed hardware goodies that come with attending) were being hocked on eBay for $2000. Given those two facts, I'm guessing you didn't manage to get your golden ticket. Well, if you are a talented developer, there is still one last ray of hope. As Google announced in a tweet earlier today, if you have some serious coding chops you could compete in a 10-day contest extravaganza where 100 lucky winners will receive a free ticket to I/O. This is reminiscent of the contests that Google held in conjunction with the release of the Nexus S, where they gave away phones to people who were the first to solve one of the daily puzzles. After announcing the challenge for that day, there will be a "lightning series of questions with a single right answer," and the 200 highest scoring individuals will make it to the actual coding round. Each day, 10 winning developers from the second round will receive free passes to the land of milk and Honeycomb. 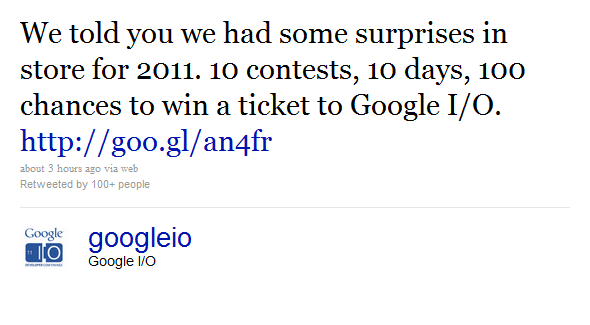 This whole contest spree that Google has been on is a brilliant move on their part. Not only does it drive hype behind their products and events, but it is also a great way for them to encourage developers to contribute to Google products. Unfortunately, the prerequisite for programming talent means I won't have to be up at seven in the morning to try and do a word jumble for a free ticket; I already know I'm not going.